Illustrated Guide to the Homeopathic Treatment is especially written for the benefit of the new practitioners of homeopathy and laymen who are interested to learn homeopathy and treat the common ailments of their family and themselves. Categories: Health, Health and Medicine, Homoeopathy, Mind, Body, Spirit. Tags: homeopathy, 9788131901649, alternative medicine, alternative therapy, complementary medicine, complementary therapy, health, homeopathic medicine, homoeopathic medicine, homoeopathy. 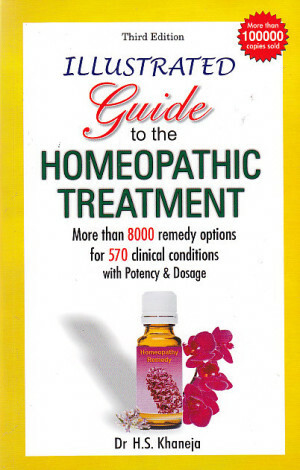 In this 3rd revised edition of Illustrated Guide to the Homeopathic Treatment new chapters like Adrenalitis, Athlete’s foot, Autism, etc. have been added. The book is unique as it contains knowledge about medicines, diseases, illustrations to explain dietary recommendations and basic facts which makes reading much more interesting. To make this book much more useful, potencies along with dosage has also been added with each remedy.